Yesterday afternoon, the moon entered its New phase, so I drew a card to see whose qualities I should be embracing from now to the Full Moon on the 6th of April. 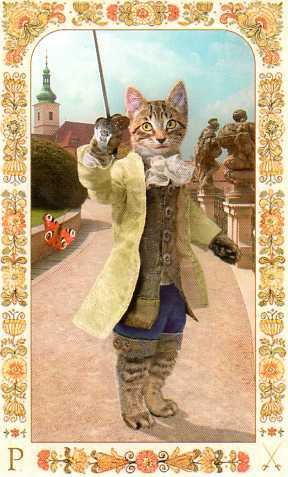 I drew the Page of Swords from the Baroque Bohemian Cats Tarot by Karen Mahoney and Alex Ukolov at Magic Realist Press. I seem to be interacting a LOT with the Page of Swords on this blog lol! The Page stands alert on the pathway in what looks to be a grand garden. Poised for a duel, he holds his sword aloft. But he’s not duelling with us, the viewer – there’s a Red Admiral butterfly that looks like it will be on the receiving end of the Page’s blade – so this Page is quick witted if he can fence a butterfly! Maybe he doesn’t intend to hurt the butterfly at all – you can’t see the tip of his blade in the image – for me that signifies that he’s not going to hurt anyone – but he can go through the motions and probably be quite a pain in the neck (or wings!) for the poor creature. The Page of Swords can be an irritant – bit whiny, a bit of a clype as we say in Scotland! OK – I’ll be trying to avoid THOSE particular traits lol! Cats like to tease and toy with their ‘catch’ and that’s perfectly suited to the Page of Swords! Pages often stand for messages – possibly from your inner child or a part of you that feels stultified in some way. For me the Page of Swords is appearing here as a timely reminder to let my head have a bit of fun. Swords like fair play and justice – and so do I – and this sometimes means that I wade in and try to help other people with their issues. Maybe it’s time to step back, not take things too seriously, have a bit of fun – like my clever and quick-witted little companion here! Have an excellent weekend – and if you have a couple of minutes, why not tell me what the Page of Swords mean to you? "For me the Page of Swords is appearing here as a timely reminder to let my head have a bit of fun." I have Rider Waite Radiant deck and the pose the Page of Swords is making in that picture makes it look like he is having great fun when learning how to swing his sword, but at the same time there is a sense of responsibility, a focus on serving justice on his face. Thank you explaining and giving your views on the Court cards, they are my biggest fear! I often see the Page of Swords as someone who has a cool new idea, but isn't yet too sure what to do with it – not very practical, and no follow-through.